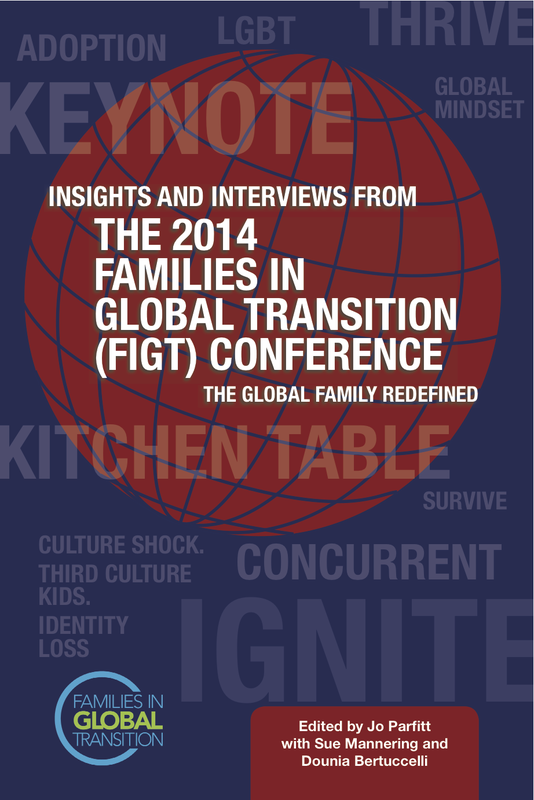 Each year global nomads, many of them serial expats, come together for the Families in Global Transition (FIGT) Conference to share their stories and expertise on what it means to move and live abroad. Now, an anthology – compiled, written and published by a range of 2014 participants – captures the essence of the conference. Almost 20 years ago, four women sat round an Indianapolis kitchen table and had a dream: To create a conference that would inspire, support, inform and encourage families living overseas. Since then the conference has taken place every year in the USA (and moves to the Netherlands in 2016). It is attended by people from every sector: Corporate, missions, military and education. Researchers, teachers, spouses and authors join experts in their field to share three common goals: To teach what they know; to make connections; and to learn more about what it means to be globally mobile. Insights and Interviews is a collection of reports from every session at the 2014 event. The anthology provides those who cannot make it to Washington with a sneak peek into what goes on there. -Interviews with specialists on expat life, including: Ruth Van Reken (co-founder of FIGT and co-author of the classic Third Culture Kids: Growing Up Among Worlds); Lois Bushong (author of Belonging Everywhere and Nowhere, one of the first books to explicitly support counsellors of TCKs); and Elizabeth Liang (actress behind the one-woman show Alien Citizen: An Earth Odyssey). -Overviews of formal and informal discussions, like the dynamics of intercultural couples; nurturing creativity in TCKs; and adoption and the expat family. Whether you’re a Third Culture Kid (TCK), expatriate parent, involved with an international school, working in international HR or on international assignment, rest assured there’s something for you. Thanks for the shootout! One small correction: my show’s title is Alien Citizen: An Earth Odyssey (not Alien Nation, etc.). Thanks for that, Elizabeth, we have corrected the name of your show!